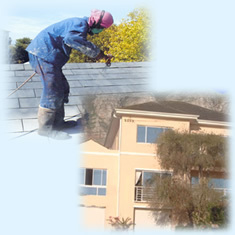 Our many years experience allows us to undertake many specialised steep and awkward jobs which other firms dare not. 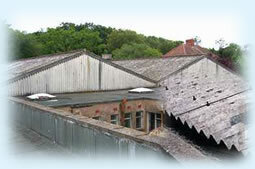 Our roofs stay cleaner for longer. On completion of the cleaning, the roof is treated with a chemical fungicide which will keep it clean for at least 2 years. A fungus-covered roof is unsightly, can make your home look prematurely old and has a major impact on the overall appearance of your home. This could reduce the value of your property. Heavy organic growth especially on the south side of a roof is often the cause of roof leaks. The joints between and at the bottom edge of tiles or slates are designed to allow water to flow down freely. During periods of heavy and prolonged rain, water can enter the roof if the joints and overlaps are choked with moss. Dark fungus infested roofs absorbs the sun's heat. Convection stored in the upper levels of the home are unable to dissipate due to insulating factors inherent within the fungus. A cleaner, lighter coloured reflective roof provides a more comfortable living or working environment. Roof tiles become porous when fungus is allowed to grow. This not only makes the tile more water absorbent but may shorten the lifespan of some types of roofs. Research suggests that the presence of fungus in close proximity to human living environment can pose some health concerns, especially to those who suffer from allergy problems. In order for companies to stay ahead and keep in line with international standards and regulations, many are taking the proactive step of cleaning and treating their fiber asbestos roofs. This will have the effect of minimizing long term health hazards and the future risk of financial implications and law suits. All work dealing with fibre asbestos cement is executed in strict accordance with the safety instructions as per the Occupation health and Safety Act 1993 (Act No. 85). Our Staff are trained and briefed on the safe working procedures regarding the use, handling , processing and storage of any material containg asbestos waste or by products. Our procedures for record keeping are intact and strictly adhered to. All necessary receipts, certificates and documents are obtained and filed in regarding to safe disposal of asbestos wate. Smart Services is a specialist applicator of the R270 (F) Asbestos Fiber Sealant, which is imported from the USA by Hydro Tech Construction Chemicals South Africa.